I applaud President Obama for inserting prevention into Sexual Assault Awareness Month as he proclaimed April 2015 to be “National Sexual Assault Awareness and Prevention Month.” Actually, since 2011 the White House has included prevention in its proclamations. 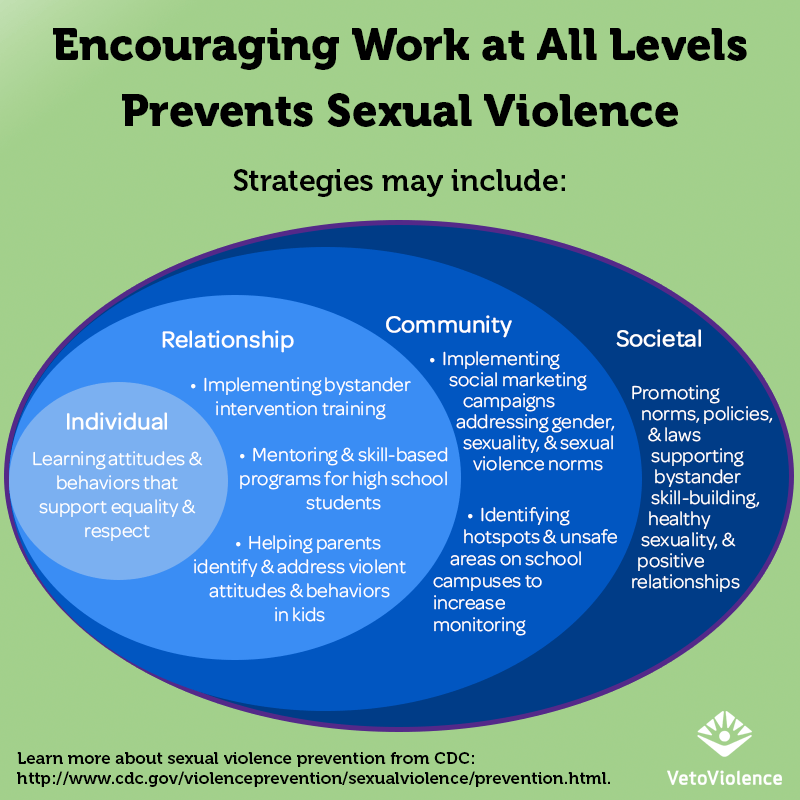 This is a great time to emphasize the need to focus on both how to respond to and to prevent sexual violence. It’s on parents and caregivers to teach their children to respect and value others. It’s on teammates, classmates, and colleagues to recognize sexual misconduct and intervene to stop it. It’s on all of us to work for the change we need to shift the attitudes and behaviors that allow sexual assault to go unnoticed, unreported, and unpunished. During National Sexual Assault Awareness and Prevention Month, let us commit to being part of the solution and rededicate ourselves to creating a society where violence is not tolerated, survivors are supported, and all people are able to pursue their fullest measure of happiness without fear of abuse or assault. I also appreciate the VetoViolence graphic showing potential actions to take on all levels (individual, relationship, community, society) of the social ecological model.